We investigate the dispersion of a passive scalar such as the concentration of a chemical species, or temperature, in homogeneous bubbly suspensions, by determining an effective diffusivity tensor. Defining the longitudinal and transverse components of this tensor with respect to the direction of averaged bubble rise velocity in a zero mixture velocity frame of reference, we focus on the convective contribution thereof, this being expected to be dominant in commonly encountered bubbly flows. We first extend the theory of Koch et al. (J. Fluid Mech., vol. 200, 1989, pp. 173–188) (which is for dispersion in fixed beds of solid particles under Stokes flow) to account for weak inertial effects in the case of ordered suspensions. In the limits of low and of high Péclet number, including the inertial effect of the flow does not affect the scaling of the effective diffusivity with respect to the Péclet number. 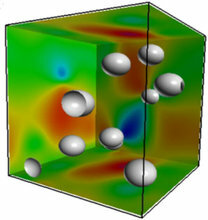 These results are confirmed by direct numerical simulations performed in different flow regimes, for spherical or very deformed bubbles and from vanishingly small to moderate values of the Reynolds number. Scalar transport in arrays of freely rising bubbles is considered by us subsequently, using numerical simulations. In this case, the dispersion is found to be convectively enhanced at low Péclet number, like in ordered arrays. At high Péclet number, the Taylor dispersion scaling obtained for ordered configurations is replaced by one characterizing a purely mechanical dispersion, as in random media, even if the level of disorder is very low.